Eons ago, in a land known as Misery Castle, four Whittenhower patriarchs leave behind a legacy for future generations. This Christmas fable, bound in leather and abandoned for decades, was located in a secluded tower, surrounded by dense forest. Destiny or a gift from above, its discovery was just in time for this soon-to-be patriarch to use its knowledge to soothe the fact he is to become a father. 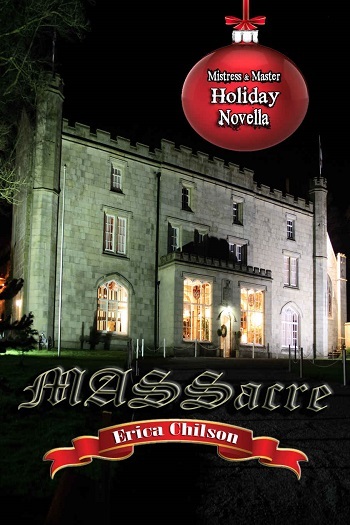 *Massacre is a novella also featured in Erica Chilson’s Holiday Anthology #1, along with Wonder and Tied Knots, offered at a discounted price. Be very clear, you really do need to have read this series to get the depth of meaning of this story. It provides some interesting clues to relationships we have been aware of, and reminds us of the earlier times and how they were supremely manipulative even then! I love the way it felt like a really old fashioned Christmas story with a moral (haha, immoral more like). I so want to be in that tower and to get the chance to read those journals; what secrets I would uncover? Not wanting to spoil the experience, I have to just tell you that it is both a fun interlude and a reminder of how many machinations have already happened to get us to where we are now. Enjoy! Reviewers on the Wicked Reads Review Team were provided a free copy of Massacre (Mistress & Master of Restraint #12) by Erica Chilson to read and review.